How do cooks learn dishes at new restaurants? 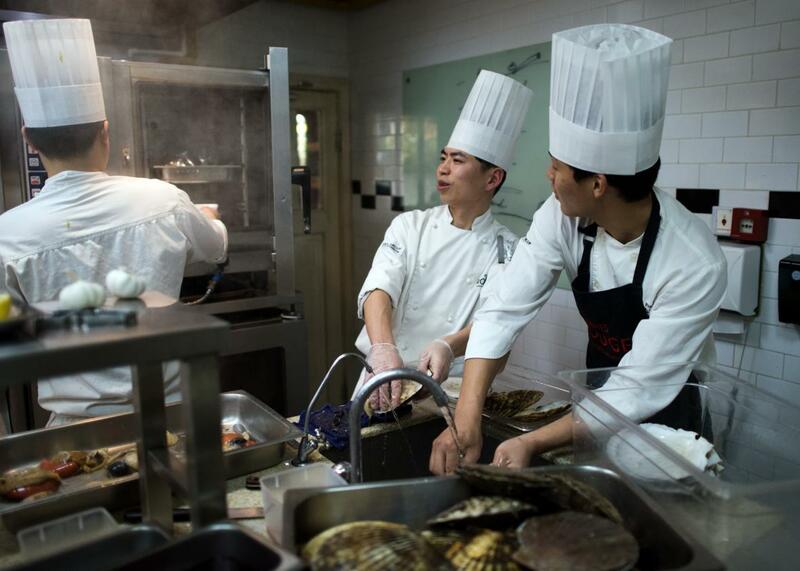 Chefs prepare ingredients to be cooked for an event in Shanghai on March 19, 2015. Usually our subs come in at prep, when 90 percent of the “magic” happens—sauces are made, things are cut to size, most things are par-cooked or made ready to be finished and plated. It’s not the most stressful time, so our sub can watch, ask questions, and get up to speed. Our sub, let’s call her Berta, has her years of experience. We got her in because she knows the cuisine, and all we need to do is explain our deviations from a normal dish or compare it with something similar. In its core, most any preparation is the same, and where differences are needed, it’s either simply a question of explaining or evident from the present ingredients and techniques. As the sous, I’ll “tournant” along her station for the first day, plate the first and second send, explain things quickly as they happen. We don’t hire some kid off the culinary school circuit for those jobs; it’s usually veterans of a few years or even a decade who can quickly adapt and tell variances from simply looking at a mise setup. A few comments (“Don’t push the rossini. We finish salamander on brioche. Plate foie after salamander. Half-wilt on the vegs. Butter in pan not plate. Sauce is drizzle, and no fancy drawings please.”) are as clear as day to a cook, as to, say, joining a dotcom and being told on Day 1: “We use Git. Send pull requests before lunch. Give us a blame and a changelog on Slack on #changes. Keep your SSH keys on your USB stick; we use them symlinked.” It’s inherently obvious to people who work in that field what this means. I keep saying this, but it bears repeating: Cooking is easy. It’s craft. It’s something that comes down to a few handful of muscle memory techniques and learned familiarity with your tools. Once that’s down, once all I have to say is: “Brown roux, thick to sauce not gravy,” and my cook knows what a roux is, how to brown it, what the ratio is, and what sauce and gravy thickness are—it’s no longer a problem.